I arrived to Washington DC on Sunday, a day before the start of the internship, and to be honest I was nervous. Despite being nervous, I was excited more than anything. I was excited to see what was in store for me this summer, and the many opportunities to learn something new. The very first thing that I learned was how to use the metro. I dropped off my car at the American Center for Physics (ACP) and had to have a crash course on using the metro. I will never forget that day, because it was an eye opening experience. I asked many questions and with some luck and kind people was able to make in back to WISH safely. I was able to see how my college experience has trained me to be independent; furthermore, I was ready to see how I would put it to practice in this internship. Sunday afternoon Demitri and Vanessa helped me move into the apartment. I am extremely grateful that they took the time to give me a hand in taking my stuff from my car into the room. On Monday, I was able to meet the rest of the interns. Everyone seemed super excited to see what was in store for each of us this summer. All of the people at ACP were extremely welcoming and encouraging to all of us. Combined with my excitement and all that positive energy from everyone, on that day I decided that I wanted to make the most of this experience. Later that afternoon, Courtney took Vanessa and I to the National Institute of Standards and Technology (NIST). We met Joe Kopanski who assisted us in getting all of the prerequisites completed such as paperwork and our NIST badge. I met with the members of my team and they gave me a little background information regarding my project. That afternoon, we took the metro home, and I was beginning to adjust to using the metro. The following day, Cathy invited us for dinner. I enjoyed the evening very much, because the food was excellent and the fellowship with my fellow interns. That was the first day that I had used the Circulator, yet another form of public transportation. Learning to use public transportation has become a new resource that is essential to move around in DC. I cannot wait to explore new stuff and thanks to all of the public transportation that can be achieved. After one week of being an intern at NIST, I see that there is much work ahead for this project. I am hopeful that after the 10 weeks, I will have accomplished many great things. I expect to learn many new things regarding my research, and also to learn more about DC and enjoy the many things there are to experience this summer. To terminate my first official blog, on Friday night we had our first outreach event called, “Astronomy on the Mall.” I enjoyed interacting with everyone who attended the event, especially the kids who were interested in physics. 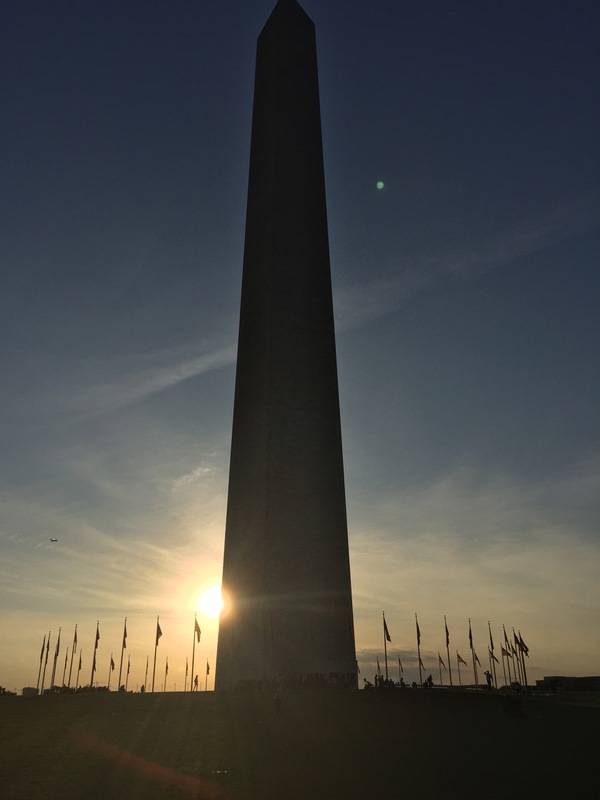 One of the biggest realizations that I had that evening was that we were in the heart of our nation’s capital. Behind our table was the Washington Monument! That night something clicked that I should enjoy each and every moment of these 10 weeks that are to come!